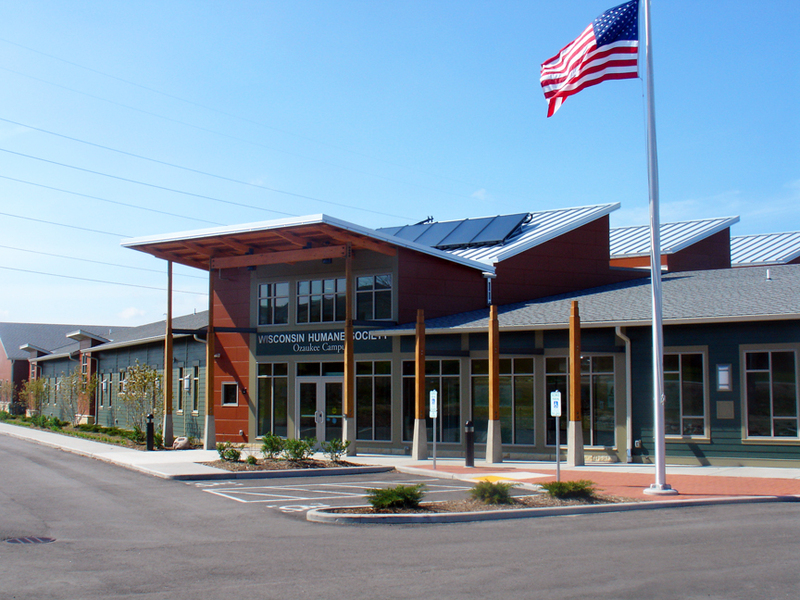 Officials from the Wisconsin Humane Society (WHS) Ozaukee Campus announced today that the shelter has been awarded LEED®Gold certification, as established by the U.S. Green Building Council and verified by the Green Building Certification Institute (GBCI). LEED is the nation’s preeminent program for the design, construction and operation of high performance green buildings. The WHS Ozaukee Campus achieved LEED certification for energy use, lighting, water and material use, as well as incorporating a variety of other sustainable strategies. By using less energy, LEED certified buildings save money for families, taxpayers and businesses; reduce greenhouse gas emissions; and contribute to a healthier environment for residents, workers and the larger community. Ventilation system includes devices that monitor CO2 levels in the building. These monitors feed the information to the HVAC system, which will adjust the ventilation rates to accommodate the actual needs. Energy recovery technology to stay energy efficient while using fresh outside air for the health of the animals. For more information about the U.S. Green Building Council or the LEED program, visit www.usgbc.org. For more information about the Wisconsin Humane Society Ozaukee Campus, visit www.ozaukeehumane.org. Reserve Your Spot On The Runway TODAY For HAWS’ Fashionable Fundraiser! A most fashionable fundraiser for HAWS! ~ Next Door ~ Hair & Makeup bySalon Medusa. * REGISTER TODAY * Reserve your place at the runway – don’t miss out! Get a sneak peek: View the slideshow from our 2011 event! Fluffy, precocious, and impossibly cute, Sprout melts any heart with ease. This sweet 8-week-old Shih Tzu/Chihuahua lifts his head and wiggles his tiny tail for the visitors who tower above him, always remaining brave despite the excruciating pain he felt just days ago. It’s hard to imagine how the little guy felt when he was accidentally dropped and badly broke his leg. No pup should ever suffer such pain. Fortunately, Sprout was brought to the Wisconsin Humane Society where our veterinarians provided him with immediate pain relief, took x-rays to determine the extent of his fracture, and gave Sprout a special, green cast. He is currently recovering in the Intensive Care Unit at our WHS Milwaukee Campus, where he has no shortage of adoration and support. Can you help Sprout? Your contribution of $10, $25 or even $50 will go directly to the care of sweet Sprout; any additional funds will be used to help treat special needs animals recovering from medical illnesses at WHS. You can also sponsor Sprout in honor of a loved one and send a personalized ecard with his photo to let them know. The Wisconsin Humane Society receives no government funding and relies entirely on the support of the community to annually care for 20,000 animals, like Sprout. 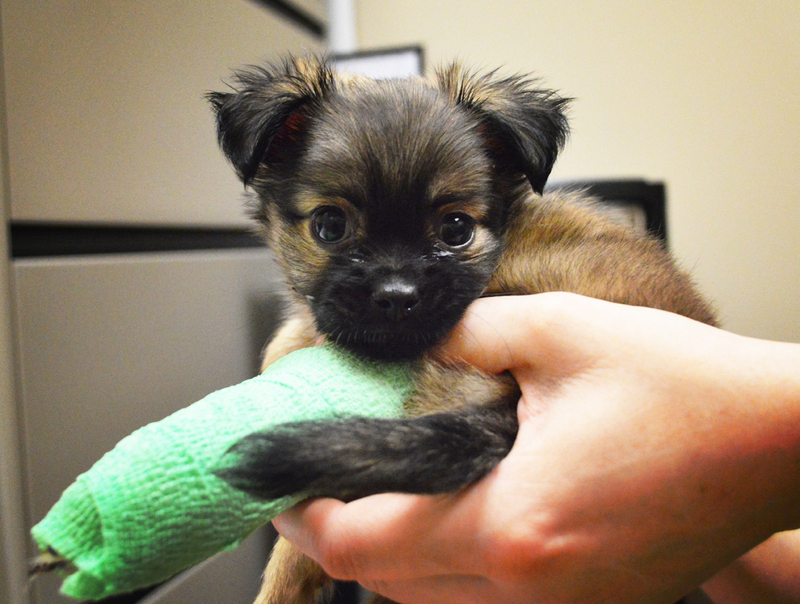 Thank you for considering helping this little guy on his road to recovery! We will keep you updated on his progress. p.s. Sprout is still recovering in our Intensive Care Unit and holds are not being accepted on him, but once he’s ready, he’ll graduate into our regular adoption program! Community Bark BAY VIEW Grand Opening Event! We’re planning a LOT of fun for our Grand Opening Event and are excited to be giving back to the pups and kittens that need it at MADAAC! What will you find at the Grand Opening? – Fun and Fundraising for MADACC! – PACK THAT PILOT with donations to MADACC!! – Event-Only specials on Dog Washes and more! – Meet some adoptable pooches and kitties! Save the Dates! More information to follow. With No Names helps feed undernourished dogs throughout Southern Alberta through support of Pet Planet. Established in 2011, Dogs With No Names is a scientific pilot program working to combat the number of homeless dogs on First Nations reserves in southern Alberta through the use of contraceptive implants. In addition to their efforts in contraception, Dogs With No Names distributes donated dog food from Horizon Pet Nutrition and Pet Planet health stores to undernourished dogs throughout two First Nations reserves in southern Alberta. To date, this self-funded and volunteer based program has received over 16,000 lb. of dog food for distribution to undernourished dogs. 1,000 lbs of Horizon Pet Nutrition premium pet food was distributed on the reserve throughout June 2012, with another 1000 lbs planned over the next quarter. Dogs have a short and difficult life without adequate food, water and shelter available to them. This is especially true on our First Nations reserves, which experience northern climates with severe winter months. While adoptions of reserve dogs are possible and encouraged through rescue groups, unfortunately, they are limited to younger pups and tamer dogs that can make the transition to a companion dog. There is also a shortage of welcoming homes. It was in the hopes of reducing the suffering of these dogs that the Dogs With No Names initiative was born. Pet Planet health stores are devoted to supporting worthy causes such as this and excited to continue this important partnership. For more information on Dogs With No Names, please visit http://www.facebook.com/DogsWithNoNames. respected, protected and kept in good health; a society without pet overpopulation, homelessness or abuse.” Through passion and innovation, Pet Planet has grown to 41 locations in North America, with 9 more stores on the horizon and has entered the U.S. market with its first stores in Arizona, educating Guardians about the health and well being of animal companions. The Wisconsin Humane Society’s Calendar Contest is Underway! 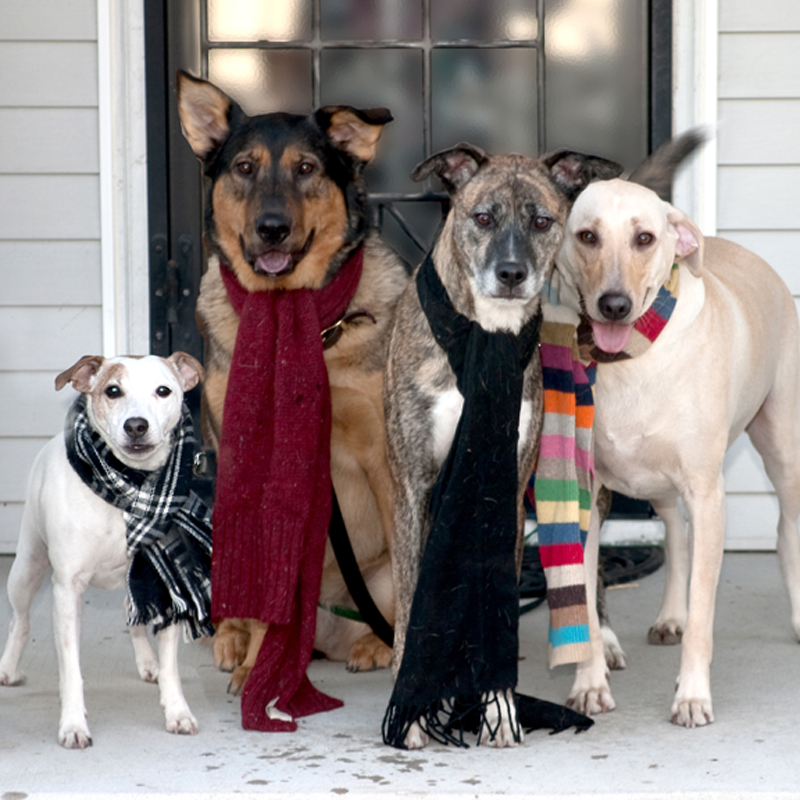 Does your dog have a better wardrobe than you? Was your kitten born to strut her stuff on the catwalk? The Wisconsin Humane Society’s calendar contest is back and entries are now being accepted! One lucky beauty will be chosen for the highly coveted cover photo and twelve others will be selected as a “Pet of the Month.” Every photo is included in the calendar. There is a $10 non-refundable entry fee for each photo. All proceeds from the calendar benefit the shelter animals. Local celebrity judges will determine the top 13 photos. Be sure to read the contest guidelines at www.wihumane.org and submit your photo by September 4! You Could Be on MTV! MTV! Asia is a world renowned pet communicator, the most gifted in her field. your life? Is it hard to tell who’s supposed to be at the end of the leash?